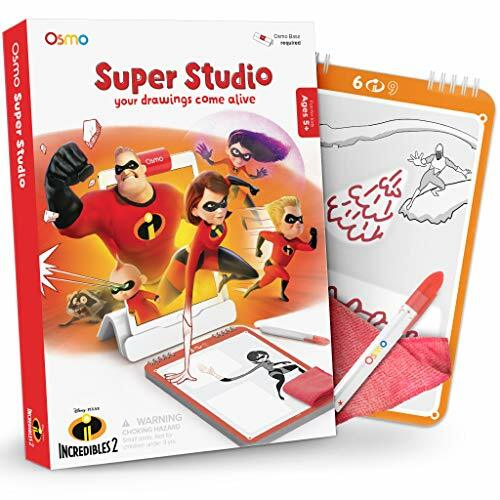 Amazon has the Osmo Super Studio Learn to Draw Your Favorite Incredibles 2 Characters & Watch Them Come to Life! (Base Required) Toy, Multicolor marked down from $19.99 to $11.99 with free shipping. That is 40% off retail! Perfect gift for girls and boys ages 5, 6, 7, 8, or 9 years old. Watch the video to see how it works! Important: iPad/Fire Tablet and the Osmo play system are required to play. (Not included). Compatible with iPad 2-6, iPad mini 1-4, iPad Air 1-2, iPad Pro 9.7 & 10.5 inch, and with the latest Kindle Fire tablets: 7th generation 7, 7th generation HD 8, 7th generation HD 10, 8th generation HD 8. This includes all kids Edition tablets. Osmo is not compatible with tablet cases.